506. Another epicyclic train in which neither the first nor last wheel is fixed. m, n, is a shaft to which is firmly secured the train-bearing arm, k, l, which carries the two wheels, d, e, secured together, but rotating upon the arm itself. The wheels, b and c, are united and turn together, freely upon the shaft, m, n; the wheels, f and g, are also secured together, but turn together freely on the shaft, m, n. The wheels, c, d, e and f, constitute an epicyclic train of which c is the first and __f the last wheel. 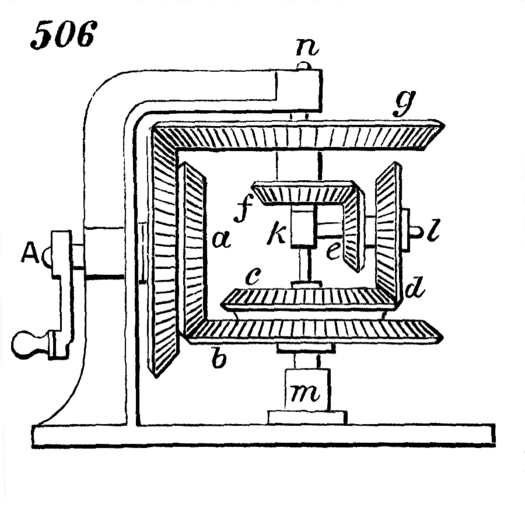 A shaft, A, is employed as a driver, and has firmly secured to it two wheels, a and h, the first of which gears with the wheel, b, and thus communicates motion to the first wheel, c, of the epicyclic train, and the wheel, h, drives the wheel, g, which thus gives motion to the last wheel, f. Motion communicated in this way to the two ends of the train produces an aggregate motion of the arm, k, l, and shaft, m, n. This train may be modified; for instance, suppose the wheels, g and f to be disunited, g to be fixed to the shaft, m, n, and f only running loose upon it. The driving-shaft, A, will as before communicate motion to the first wheel, c, of the epicyclic train by means of the wheels, a and b, and will also by h cause the wheel, g, the shaft, m, n, and the train-bearing arm, k, l, to revolve, and the aggregate rotation will be given to the loose wheel, f.